I Added more rooms in ground floor and made a new swimming pool in the garden; totally changed the roof design, and changed the external wall design gates, doors etc. 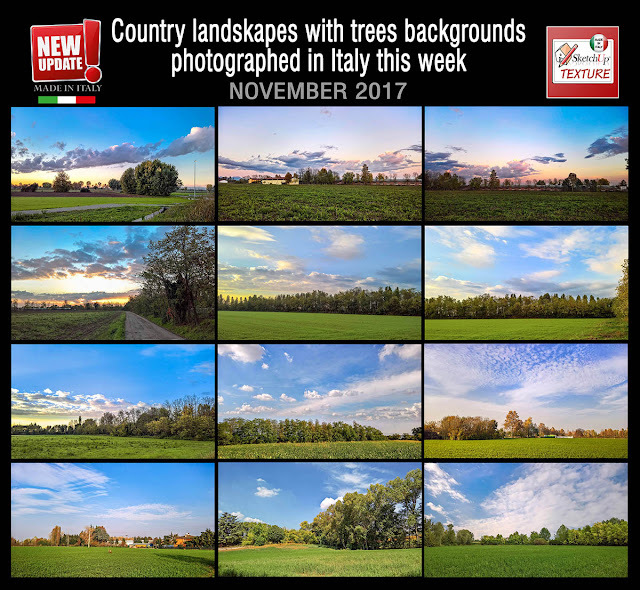 In the zip file, I included the exterior vray visopt of this scene, and the vray IES light, in addition to some vray Proxy trees. Obviously Here i am not Included HDRI & proxy trees of paid versions. I hope this 3d model will be useful to those who are learning 3D visualization techniques. Click HERE for download sketchup 3D model " RENOVATED HOUSE "
I included in the zip file archive, also the vray exterior Visopt of this scene, the IDRI and the vray proxy trees. 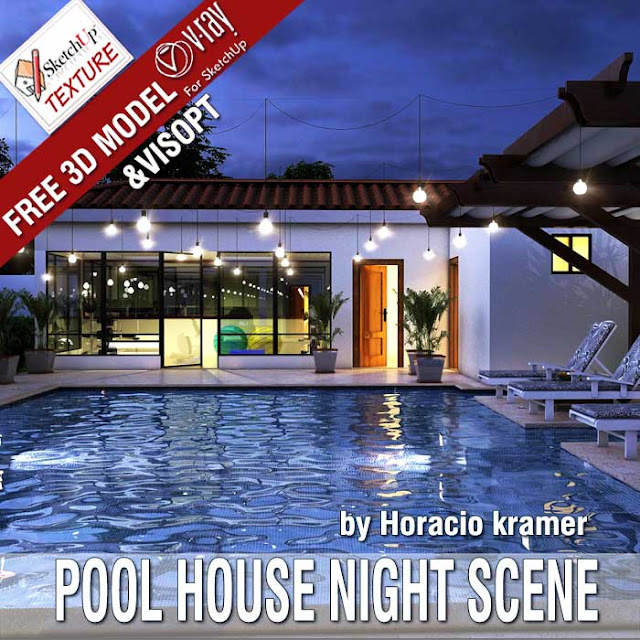 I included in the file archive the IDRI used in this scene, the vray proxy trees and the vray IES light. Hope you like it ! IMPORTANT NOTE : the file has many polygons, so I advise you to check out the performance of your PC before open it. 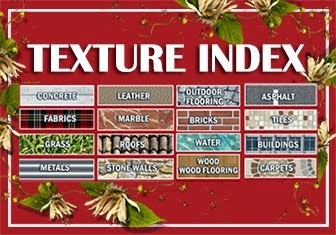 You can contact me my on my facebook page to get more information. 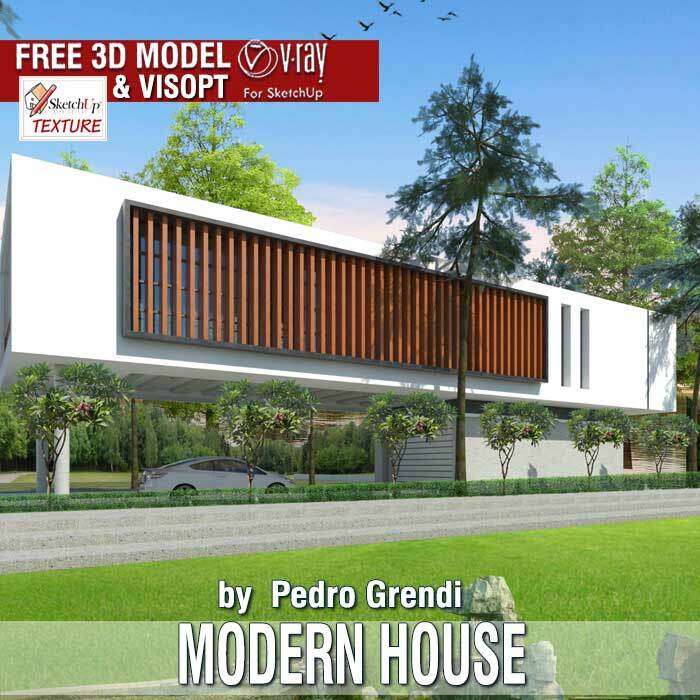 I am happy to share with members of Sketchup Texture Club, my last sketchup 3D model of this modern contemporary house, full textured. 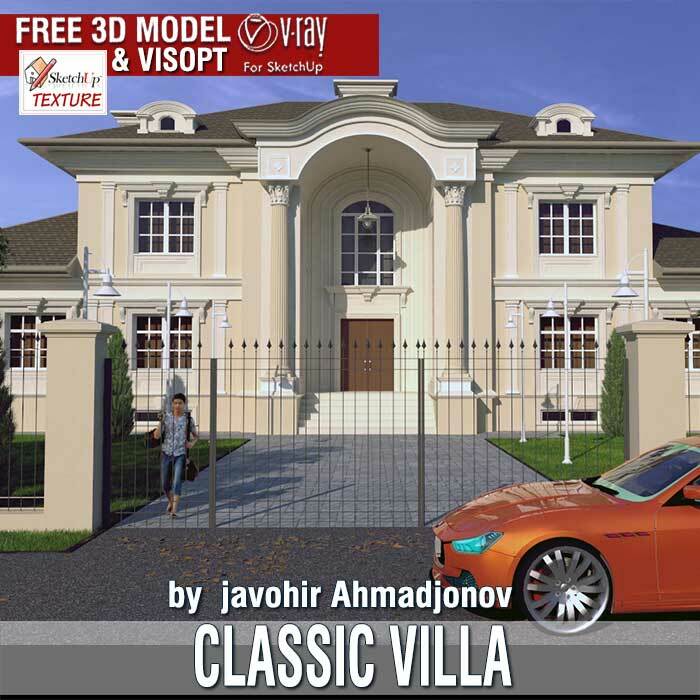 The 3D model, was done with Sketchup 2017, and rendered by testing Vray for SketchUp 3.4 beta, but was made available in SketchUp 8. I included in the zip file archive, also the vray exterior Visopt of this scene, day and night and I hope will be helpful for our CG artist community. Cheers to all ! Sarath Sasidharan Pilla. I hope you enjoy it and it will be useful. 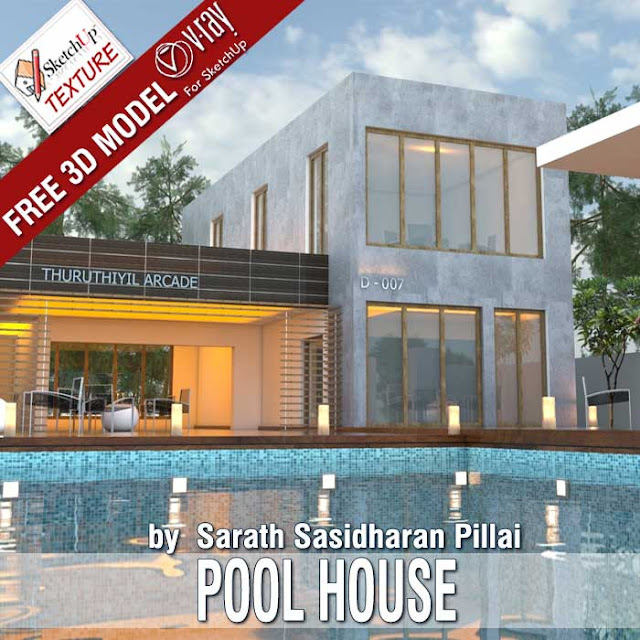 Click here to DOWNLOAD the sketchUp 3D model POOL HOUSE by Sarath Sasidharan Pillai ATTENTION, to download it : you will be redirected on our new website, where you need to register. 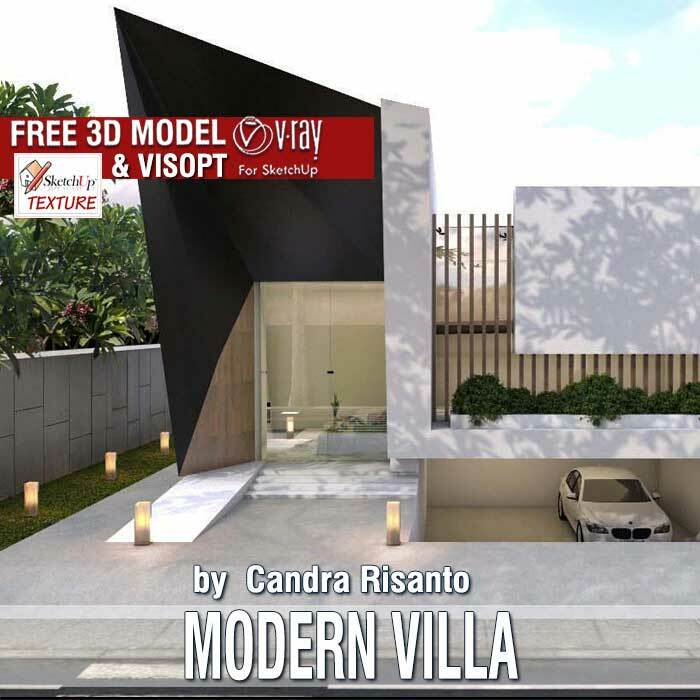 This modern villa, is ideally set in Texas. 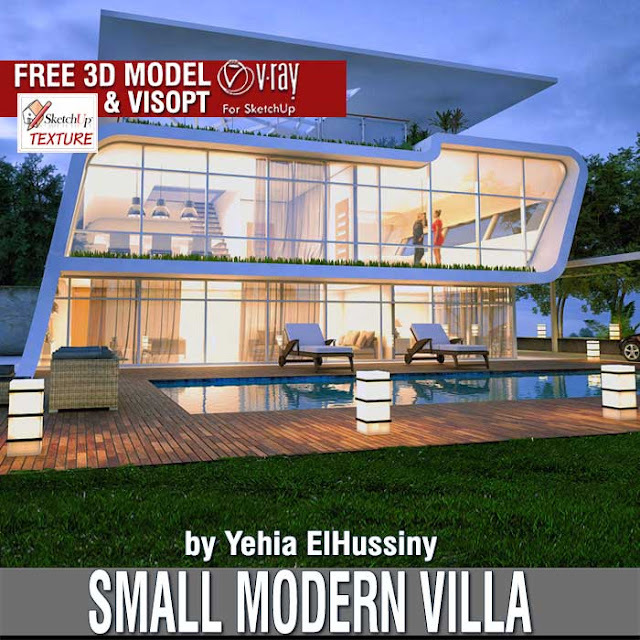 I really like the modern architecture, play with asymmetric volumes, combining different materials such as wood and concrete, creating contrasts, empty and full, shadows and lights. I hope you like it. 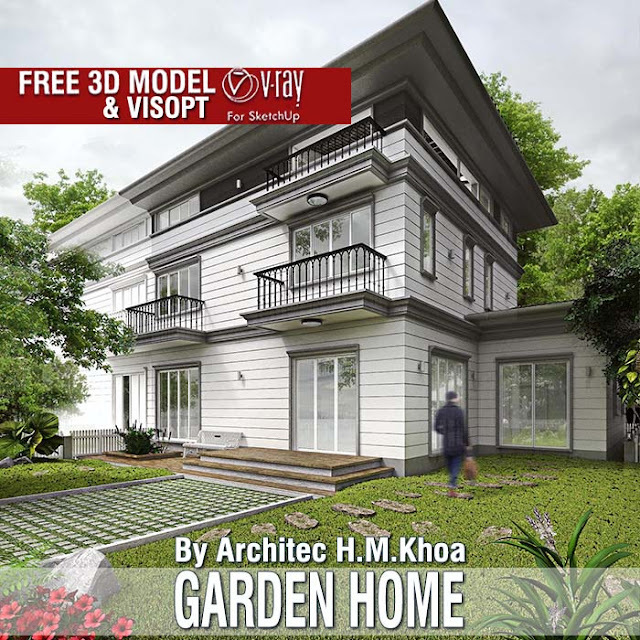 I included in the zip file, the sketchUp model available in sketchUp 8, the vray exterior Visopt of this scene, and the vray proxy vegetation . 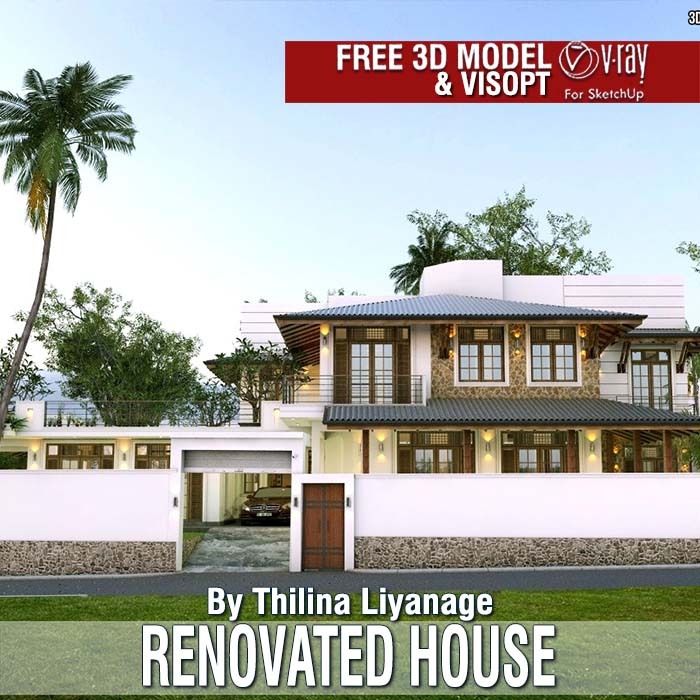 Hello everyone, this is the project of expansion, of my aunt's house, which includes the addition of a room and a guest bathroom, the inclusion of a swimming pool, a small gym and a deposit. 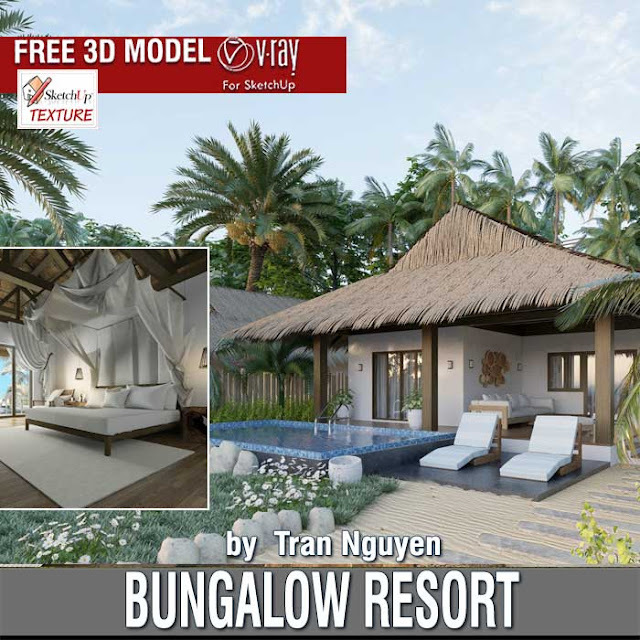 Have also been provided two areas to relax and enjoy with friends. 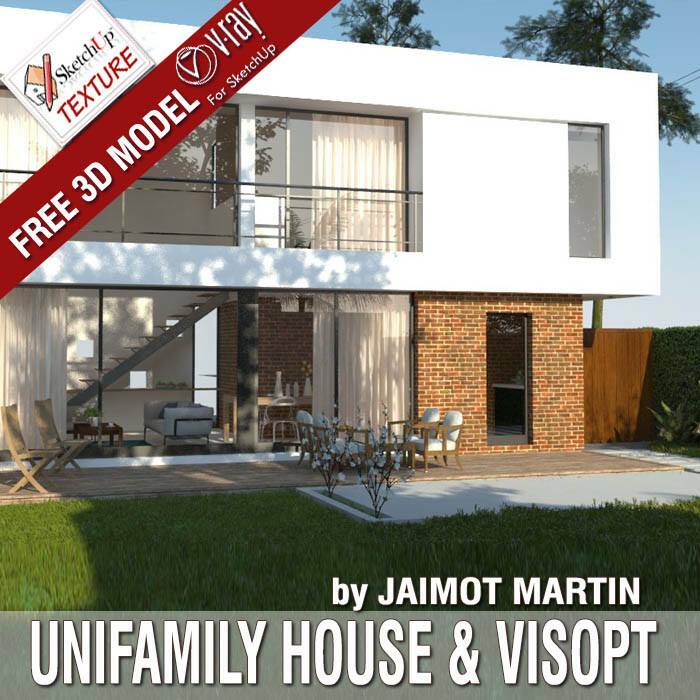 The 3d model, was created in SketchUp 2016, but is available in SketchUp 8, rendered in vray for SketchUp 2.0. In the zip file, I included the vray exterior Visopt, HDRI, and vray proxy vegetation, vray IES light which I used for this scene. 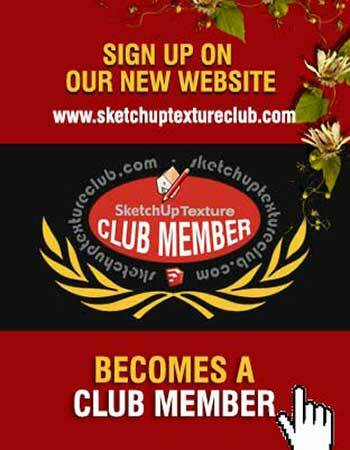 I'm happy to share my work it with all members of Sketchup texture Club. It is a modern building on two levels, finished in different materials: concrete, wood and stone. The model also contains beautiful 3D trees. 3D palm , and 3D garden trees. A big thanks to Jaimot for this share ! 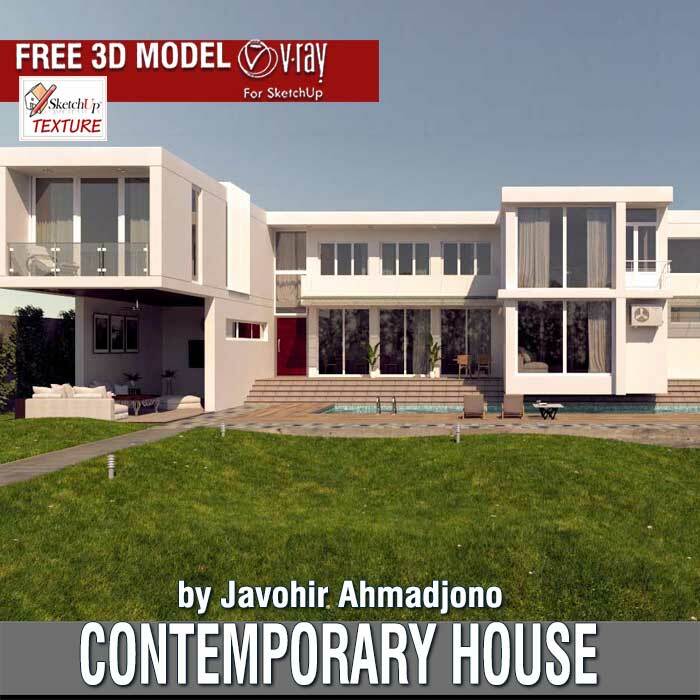 Sharing this 3d sketchup model, is truly exceptional: it includes everything you need to proceed to do your exercise with vray. In the ZIP file you will find 2 sketchup files, one with the settings to render in exterior, and the other with the settings for interior rendering : 2 vray visopt file interior and exterior , all textures and maps , vray proxy vegetation and the vray IES light. a big thanks to Jamot for his contribution! 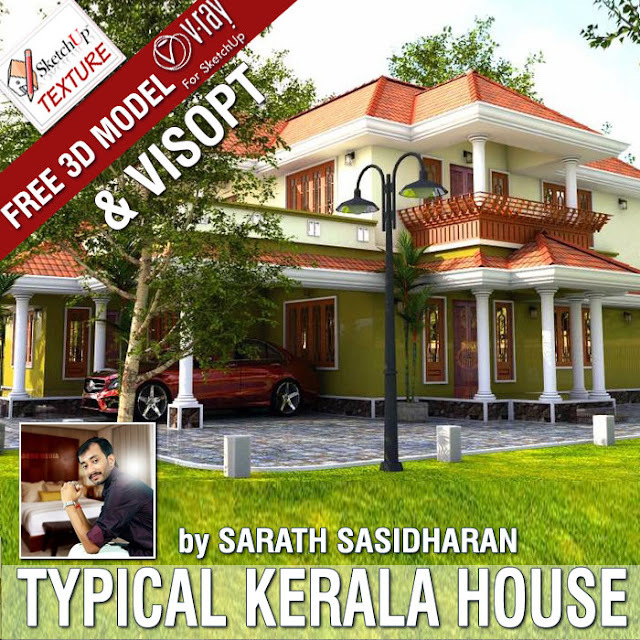 Kerala architecture is a kind of architectural style that is mostly found in Indian state of Kerala and all the architectural wonders of kerala stands out to be ultimate testmonials for the ancient vishwakarma sthapathis of kerala. Kerala's style of architecture is unique in India, in its striking contrast to Dravidian architecture which is normally practiced in other parts of South India. The 3d model, is available in sketchup 2013 complete with: all textures - vray Vrmesh, vray trees and proxy materials and exterior Vray Visopt. This is a really great 3d model for your exercises vray render, but remember to always give credit to the author of the model, not only for courtesy but is also an ethical duty. 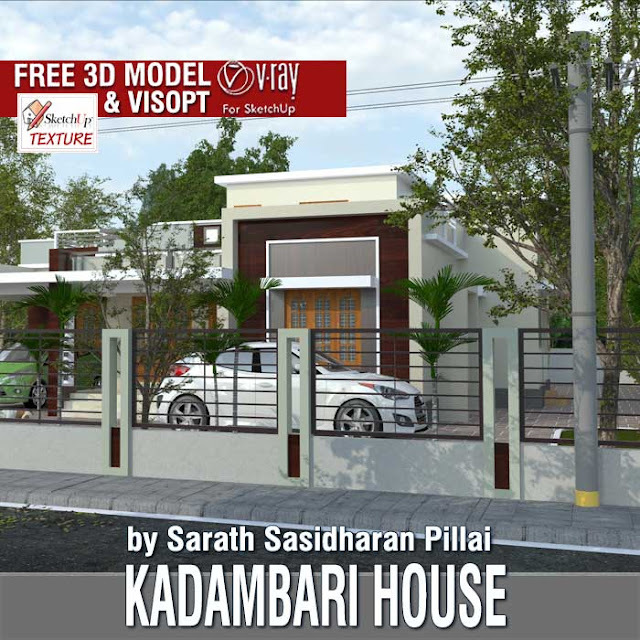 A big thanks to SARATH for this great contribution at our sketchup community! 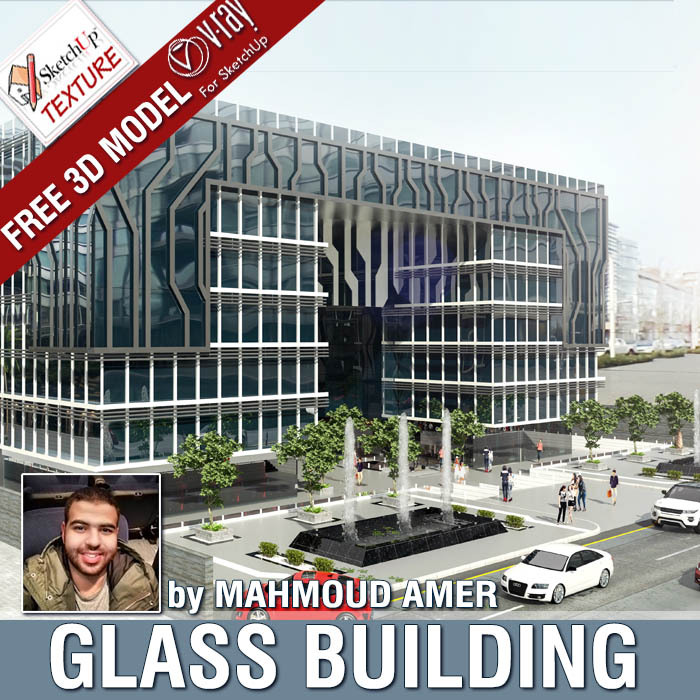 We had not a glass building in our collection of 3d models, and MAHMOUD AMER has thought to address the lack, with this beautiful model made of SketchUp in 2013 but downloadable in SketchUp 8, so that all may be able to use. Thanks for your contribution to our Club! Thank you very much for this contribution to our community! 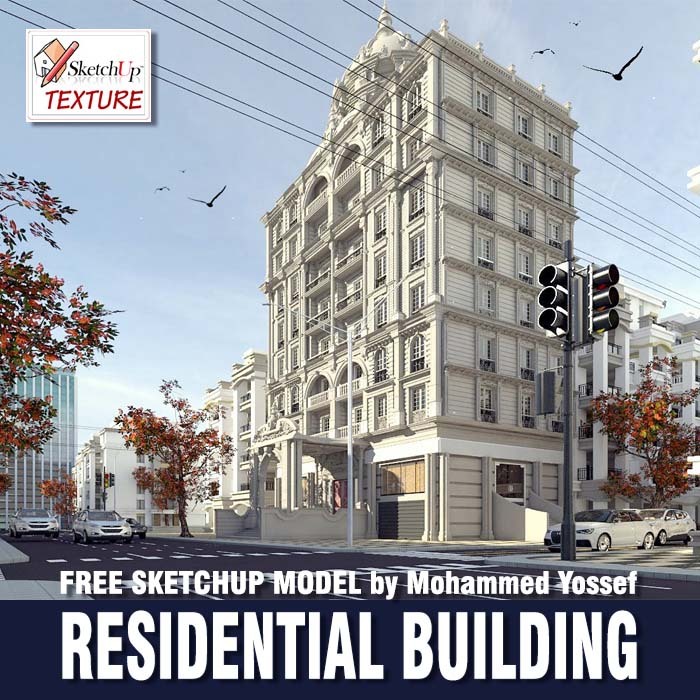 Guys, share in our workgroup your render test, the best will be published in the gallery "Render test user"
We thank Mohamed Yossef, for this excellent sketchup 3d model that highlights its modeling capabilities in sketchup. Certainly a challenging job that requires a good knowledge of this type of architecture. This amazing free sketchup 3d model, designed by Thilina Liyanage is a single family home with a nice game of volumes, very well balanced, the which gives it a very cool. all textures - vray Vrmesh trees and vray proxy materials and exterior Vray Visopt. 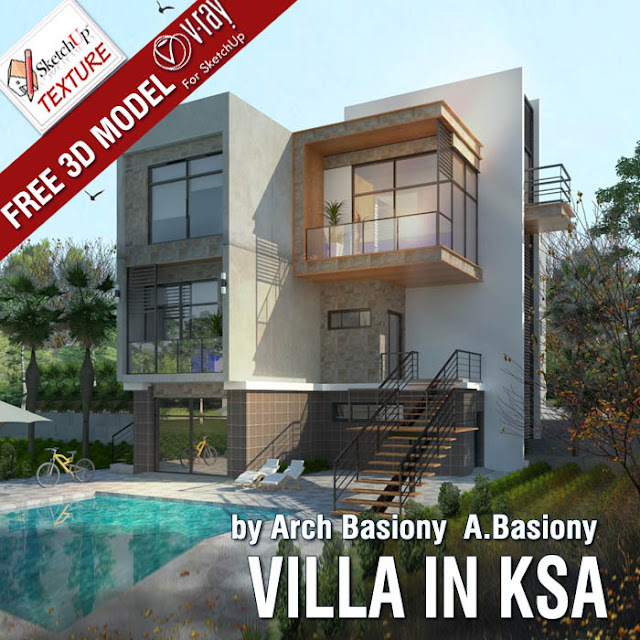 This is a really great 3d model for your exercises vray rende, r but remember to always give credit to the author of the model, not only for courtesy but is also an ethical duty. 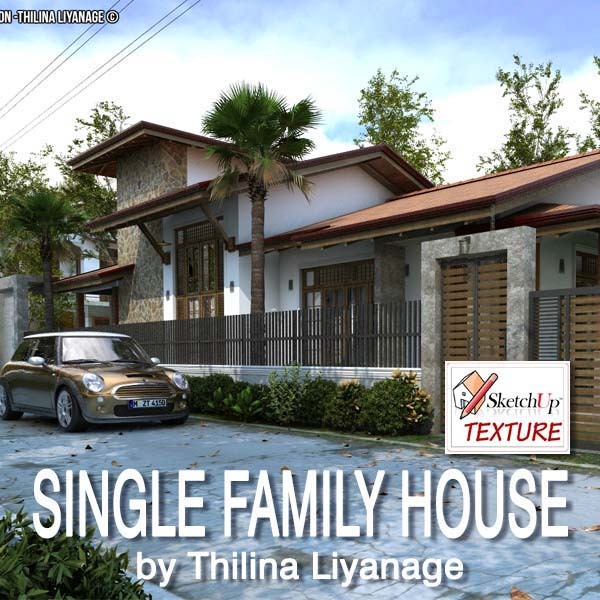 A big thanks to Thilina for this great contribution at our sketchup community! 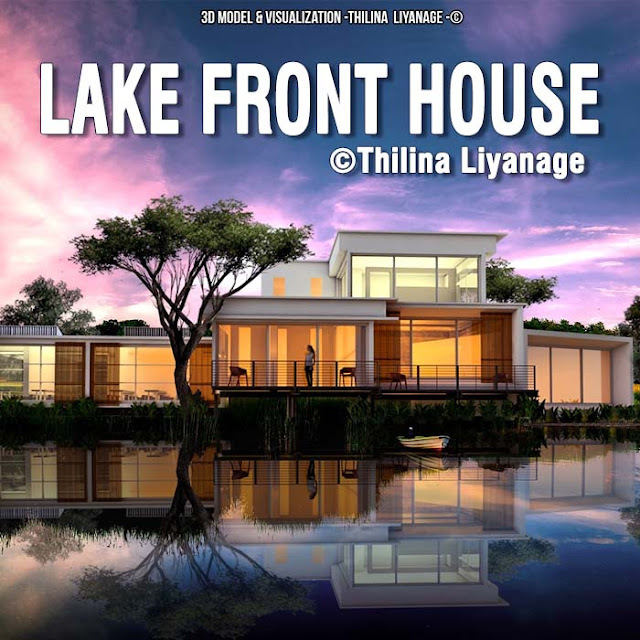 This Great 3d model, is a courtesy by Thilina Liyanage , who shared exclusively for us, his 3d model, made in sketchup 2014, and very well rendered with vray 2.0. The 3d model is available complete with PHOTOSHOP POST PROCESS FILE . I made this for my rendering practice,so here i made front part of house only,not a full model,you can get ideas from this, about lighting and post processing. 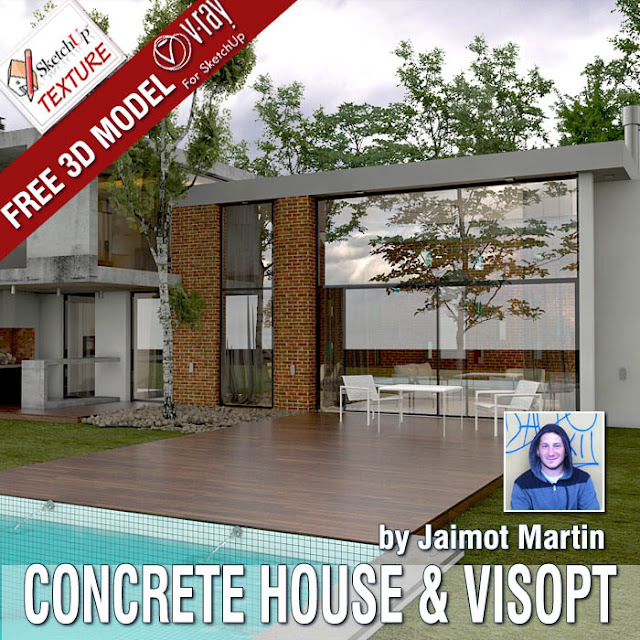 This is a really fantastic 3d model for your exercises vray render!